2) Season the salmon to taste with sea salt and freshly ground black pepper. 3) Top each fillet with a sprig of tarragon and some lemon zest. 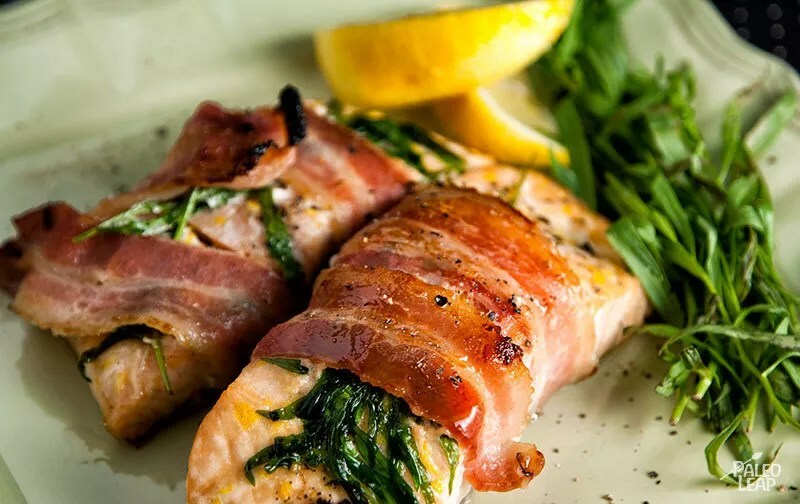 4) Wrap each fillet with 2 slices of bacon. 5) Heat butter in a large ovenproof skillet over a medium-high heat. 6) Fry the salmon on each side until golden brown (about 2 minutes per side). 7) Brush each fillet with the maple syrup or honey, if using, and transfer to the oven. 8) Place the salmon in the oven until cooked through (about 8 to 10 minutes).